one who aspires, often vainly, to emulate another’s success or attain eminence in some area. The description above is from Urban Dictionary. to be at peace… back to wholeness, so to speak. I like the last one, a simple and direct definition of the word. The word zen can portray many qualities, such as elegant, relaxed, modern, chic, spiritual, practical, among many others. The word has evolved so much that now people say ‘Zen Buddhism’ when they meant the original zen meaning, while zen on it’s own have much wider contemporary usage. Wannabe Zen means aspiring to be at peace, aspiring to go back to wholeness. I originally thought Wannabe Zen as a brand name for my yoga-related business (see about WBZ page), but since the beginning I haven’t clearly defined anything for it. I just liked the term because I thought it’s catchy. I had a vague idea of Wannabe Zen as a collaborative blog, something like TinyBuddha. I also thought of Wannabe Zen as discussing meaningful things like Brainpickings. I wasn’t sure where to start, almost two years passed and nothing is happening on Wannabe Zen. I have my own personal blog where I write weekly on various topics in somewhat random fashion. A few days ago Christine messaged me saying “Let’s write a blog together”. I thought what better way to use Wannabe Zen than for this purpose? A collaborative blog about being here now and remembering our true nature. So here it is, Wannabe Zen, live. Me and Christine will take turns in writing something here once a week. We will share our thoughts about happiness, spirituality, mindful living, self enquiry, love, meaning of life, meditation, etc. We hope you’ll enjoy this website as much as we enjoyed creating it. 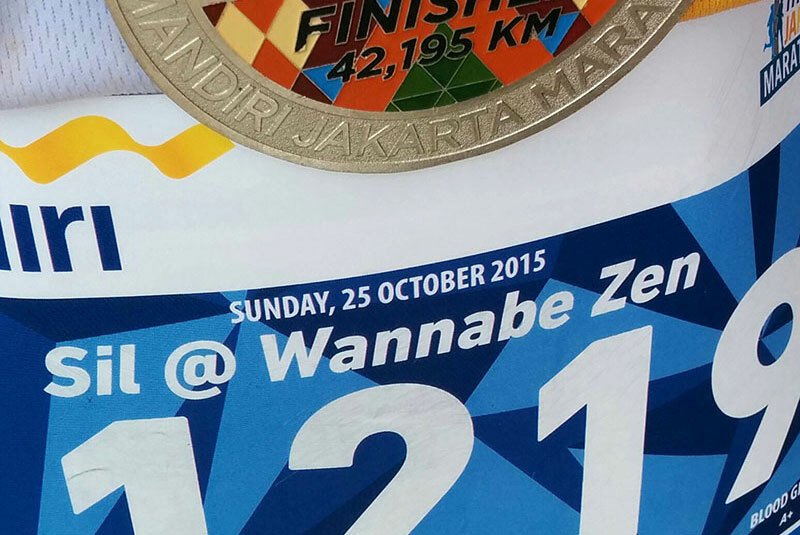 Below is a picture of my running race bib for Jakarta Marathon, last Sunday 25 October 2015. I registered and entered the name ‘Sil @ Wannabe Zen’ to be printed on this bib back in April, and never really thought about it again, until last week when I picked it up. I normally use my own name or ‘Running Yogi’ for race bib. Perhaps it was a hunch that Wannabe Zen will come alive this month.